Stampin' Up! 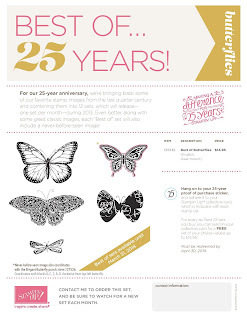 is celebrating their 25th Anniversary this year by introducing a new exclusive stamp set each month that will be available through March 2014. For every 6 sets that you purchase, you'll receive one FREE. To view the sets for the previous months stamp sets and other current promotions, click HERE.